When I first came across this new home I just felt like it had to be California built. It is about as far away from typical central Virginia architecture, and eons away from my much admired shingle style homes. 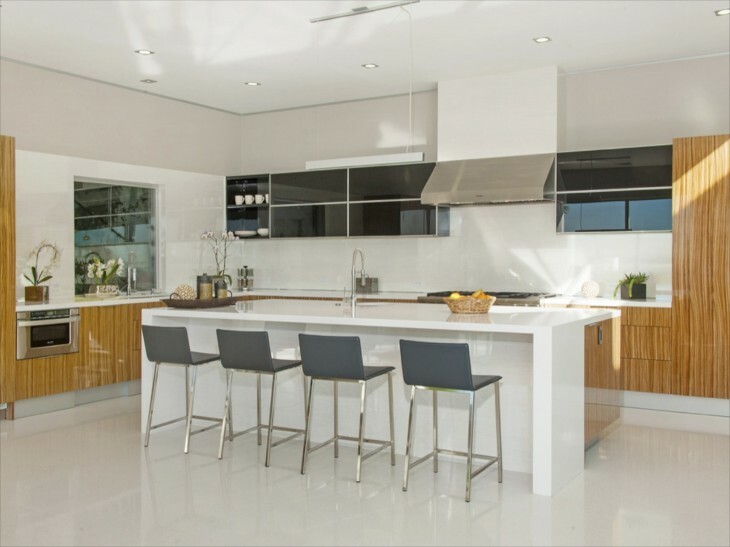 I often find myself longing for a modern aesthetic that is minimalist enough that I could rush through the house with a power blower and the house would be clean in a minutes time…..no excess decor to dust, no magazine and books piled on the library table, just clean uncluttered surfaces in the kitchen to make cooking cleaning a breeze. There are just sometimes I wish for it, and really hard. Then, when I see a contemporary decor or modern flair, I look for a few minutes with the above mentioned thoughts, and then almost without realizing it, I am thinking, “Oh, wouldn’t it be amazing to put an oversized modern work of art over on that wall” and then, “oh, and yes, a piece of sculpture in that corner on an antique pedestal for contrast,” and then, “yup, that kitchen needs a couple of boldly colored items on the counter in that all white kitchen to add some life” and the entire minimalist idea in my head goes all to heck. 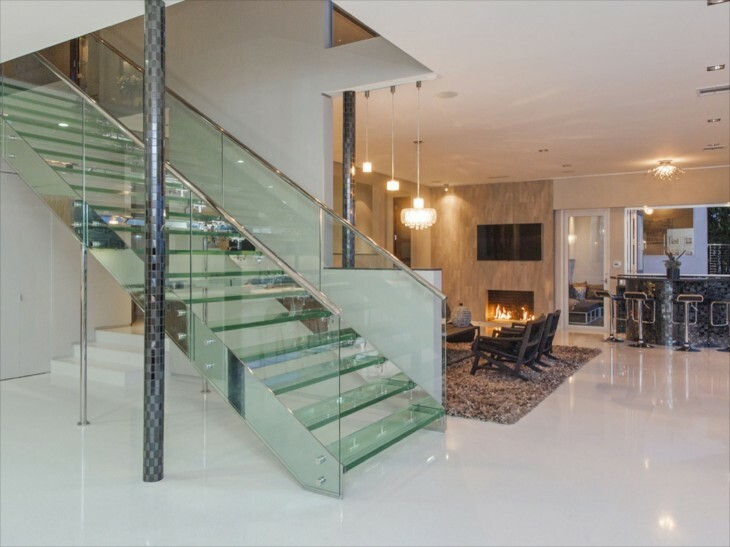 I have such admiration when I see a beautifully designed modern space, yet as much as I say I would love to live in it, it would no longer be what it should be if I resided there. Every time I see a beautiful modern home exterior at night, all lit and glowing, they are the most beautiful homes to me. I guess it is time I sit down at my drafting table or pull up CAD and develop a modern exterior and see what I can do that would be ok for me on the inside. 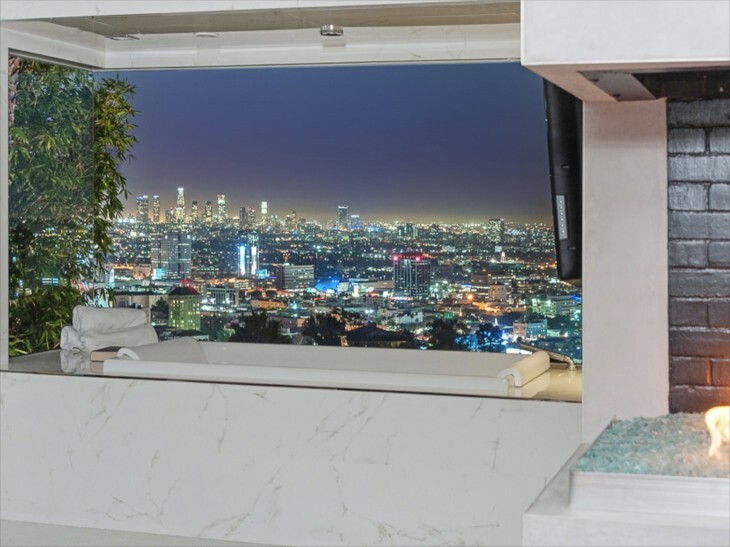 This home is also about the views, and the views and did I mention the views? 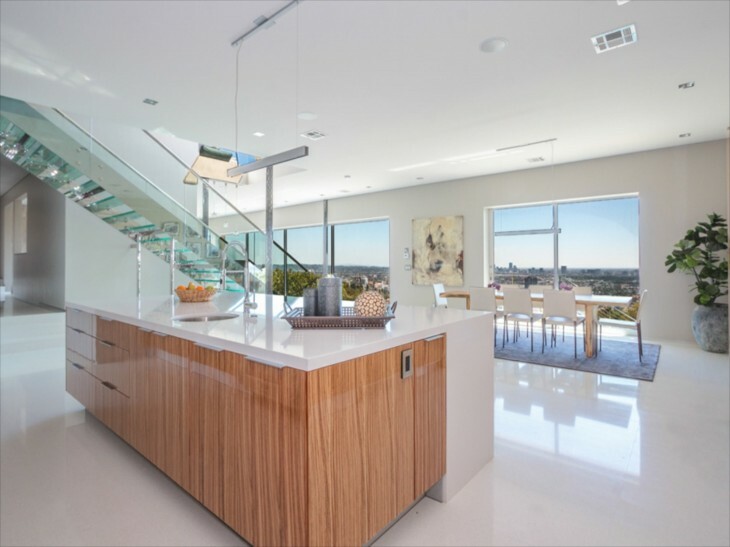 This just-completed, 4-bedroom, 4,446 sq ft., 4 bedrooms, 3.5 baths, of stunning contemporary home provides jaw-dropping views and a sophisticated, elegant design. The main floor is comprised of a very large, open gourmet kitchen ,with a massive island, pro-style appliances and exotic wood cabinetry. The kitchen opens to the dining area, living area, wet bar (with its own sink and fridge) and a guest bedroom with its own private entry. Below is a spacious pool deck with outdoor dining area, an outdoor kitchen, outdoor tv and a breathtaking, completely-tiled infinity spa and infinity pool. There is a sizable lawn and garden area, with a border of shade trees — the perfect place to tap into your inner Zen, throw a Frisbee, kick a soccer ball or play with your pets. Two additional bedrooms sit on one side of the house, and on the other – all to itself – is the truly masterful master suite, with its own outdoor terrace, spa-like bath, and spacious double walk-in closets. Broad openings with telescoping Fleetwood doors allow the year-round enjoyment of the Southern California weather and the spectacular views. 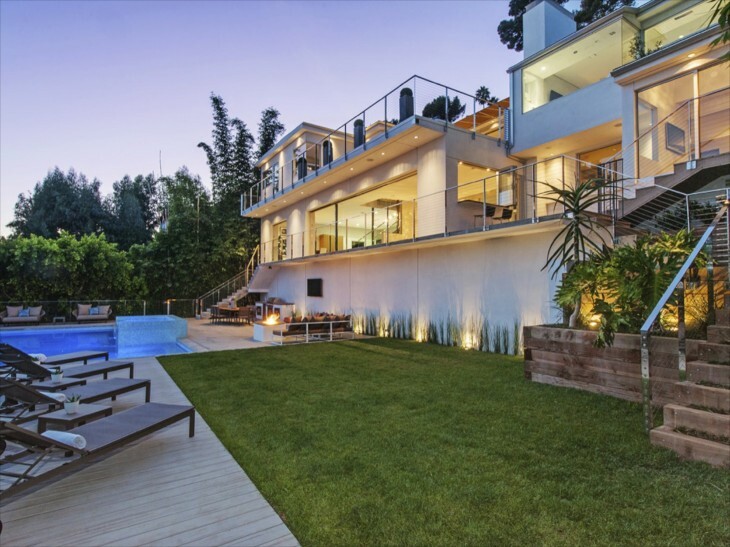 This new construction sold quickly and for more than $5,000,000. See what I mean about the view. Wait until you see inside. 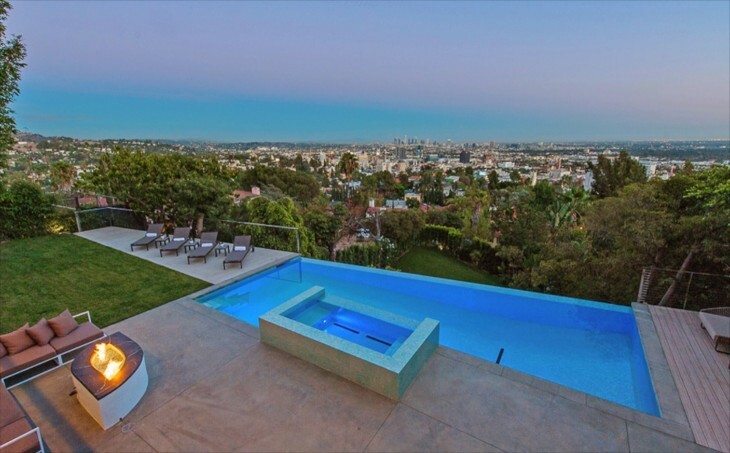 The home is in the Hollywood Hills. I have looked at many home over the years, and I don’t recall seeing such vast a view, and from anywhere in the home. This is only part of the outdoor space. Give me a glass of wine, a good book, my two dogs by my side and I might watch my last sunset from here. I am crazy in love with the stair case. I know, it is probably not practical, but then again, it might be. I love it because visually it does not block views from one room to the next, yet its presence still gives definition to creating separate spaces on each side. I really have moved a lot during my years, from detailed, more ornate kitchen cabinets, to flat surfaces, especially slab cabinet doors. You can still have the warmth of wood, like here, but an easier to clean kitchen surfaces. 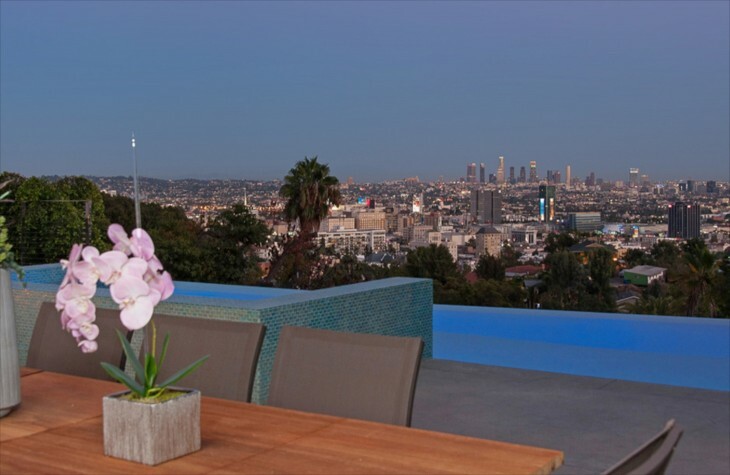 And cooking dinners and entertaining is a whole lot more fun with views like these, although I really like to cook no matter what, but still……. Carter, my Afghan Hound and Whitley, my Beardie would have a ball playing in here on rainy days. Carter especially would be worn out at the end of the day, and that is a good thing! The dining room table is gorgeous with its wood slab top. In California and Florida you see a lot of these disappearing window walls so you can open your indoor spaces entirely to the outside. I could not do that here in Virginia….too many bugs. In Florida most homes have these incredible screened rooms that attach to the homes. These windows are by Fleetwood doors and the windows simply telescope open. This home illustrates how sq footage can either expand or contract visually, depending on how the floor plan is designed. This home seems to give an impression of being much larger than its 4446 sq ft might indicate. The wet bar in the corner has its own frog and sink, making it easy to entertain on that side of the house. 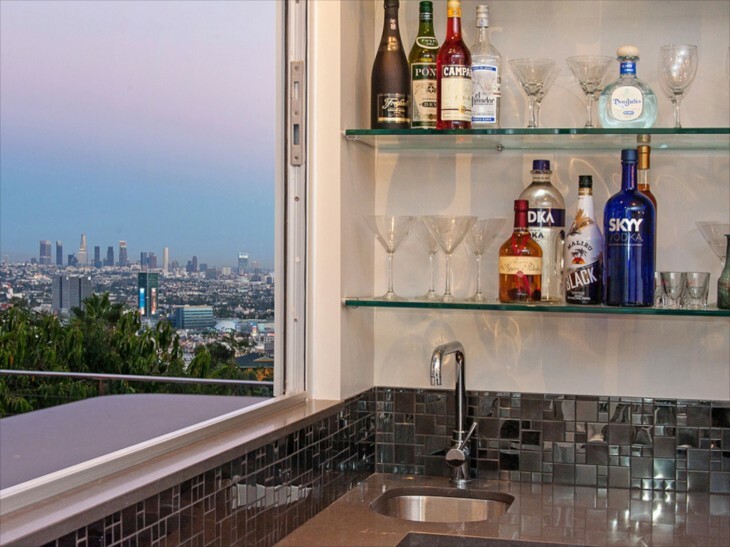 Even the wet bar has views of Los Angeles. Here we see the back of the home at sunset. I like how they have used ground lighting to wash the home in light. When it is dark, it is beautiful. 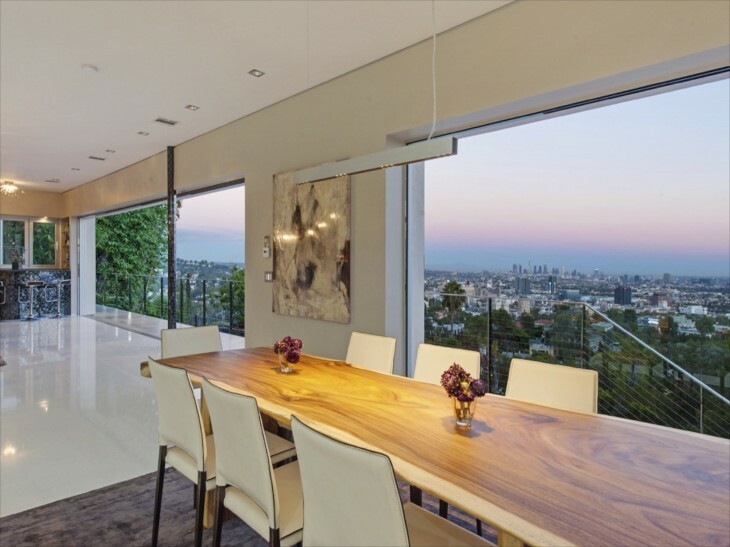 View from the dining room at dusk with the glass doors opened. 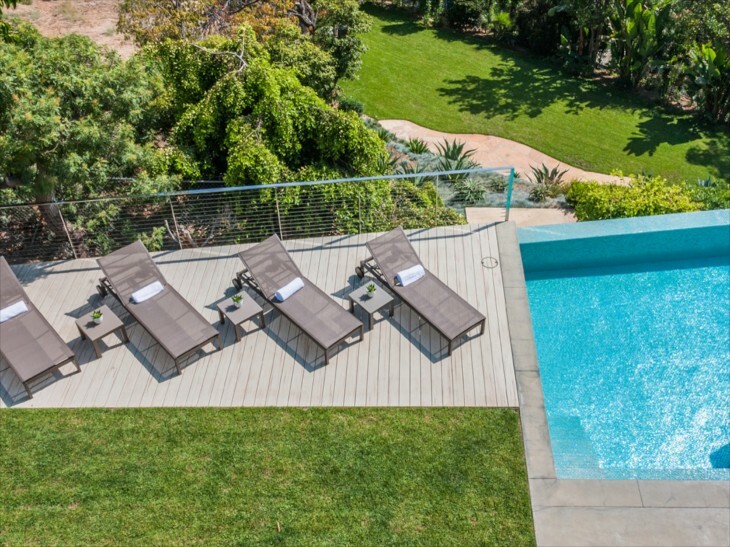 Beyond the pool is a grassy landscaped area for play or relaxation. 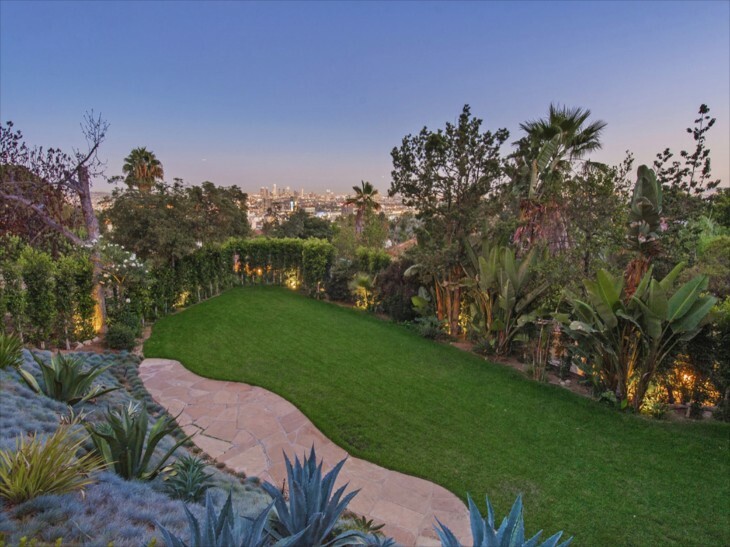 This part of the yard is more enclosed and beautifully landscaped with tropicals. View from the top of the stairs looking out. There doesn’t seem to be a room without a view. That is difficult to achieve in a more traditional home. The master bedroom. What more can I say? Notice the fireplace just to the left on the outdoor space. That fireplace is also visible from the bathroom. The master bath…….oh my……notice the tub is set in a bay with glass on three sides. In the shower are two huge overhead rain showers. I have a large shower also, and could not do without a bench. 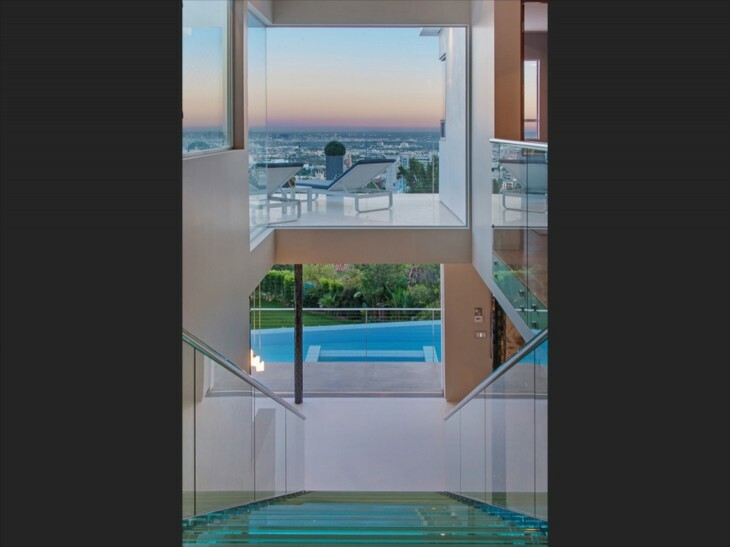 This amount of glass is easy to care for….simply squeegee after you shower. You are left without any water marks or streaks. View from the tub at night. 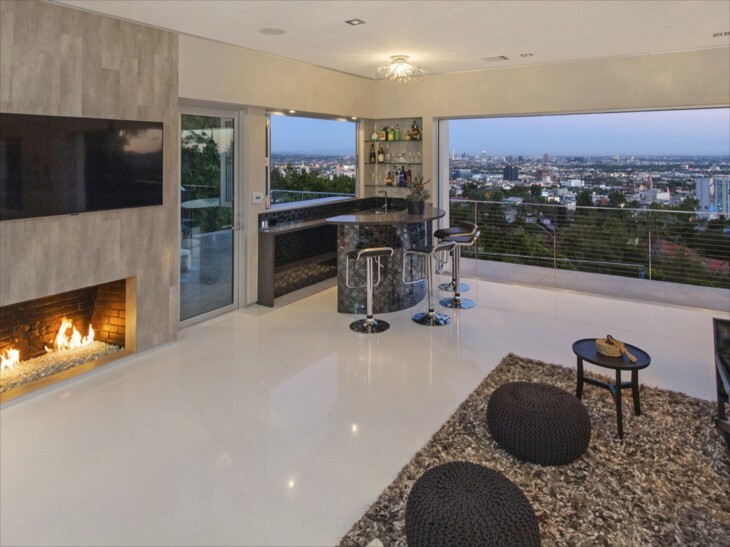 Notice the fireplace to the right of the photo….. the same one that is outside the master bedroom patio. Long stretch of vanity and storage so there is no clutter. Another view of the master bedroom private balcony retreat. Another view from the back. You can see another home just above it. I hope you enjoyed a tour of the amazing home. 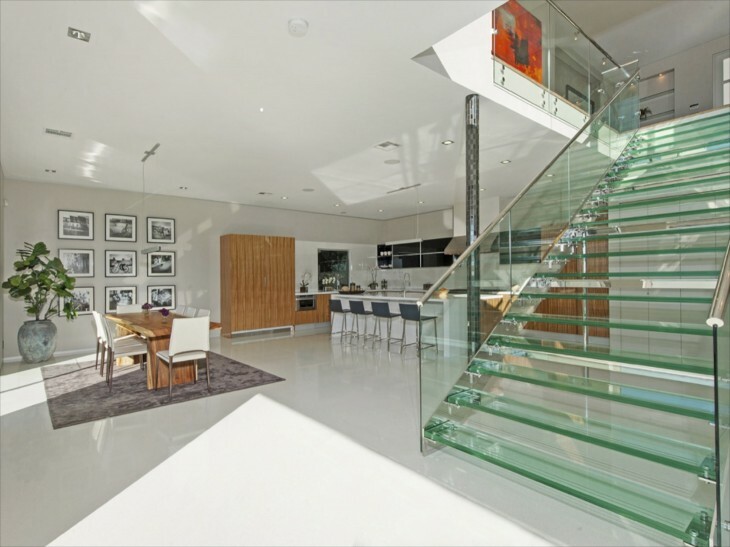 Architecture and interior design is so powerful, because it does implore you to react to it. Over many years in the design field I have been fortunate to see amazing design, and although it may not always be my preferred aesthetic, it helps you refine your own, as well as your appreciation of it all. It also has made me say to myself so many times…..I will not live long enough to design and live in all the houses and utilize the ideas that are still in my head. It is a passion that increases in me still. Wow!!! Location, location, location!! What a view! I thought so as well. 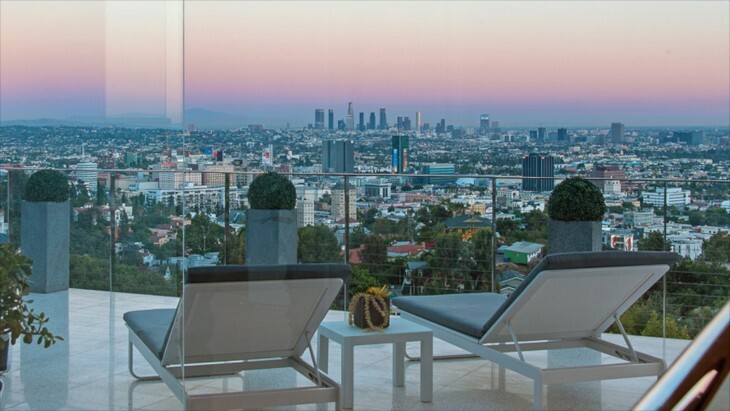 It was just such a sweeping view of Los Angelos and the surrounding area….amazing.